Late Saturday morning, a dozen Space Dragons and a handful of friends set off on the South Fork Trail in the San Gorgonio wilderness. Our goal for the day was to hike 7 miles to Lodgepole Spring and set up base camp. By late afternoon our little village was established at 9,000 feet, and we spent the remainder of the day relaxing and enjoying each other's company, cooking up some gourmet chow, and trying to keep the insects at bay. Everyone was in bed by 9 pm so that we could wake up at 1:30 am Sunday morning for our 6-mile hike to the summit. Headlamps securely fastened and carrying smaller packs, we hit the Sky High Trail at 2:25 am. The group stopped at 11,000 feet for about 45 minutes to watch and capture the sunrise. It was cold, but worth it! Sunrise from this elevation is a beautiful sight that few ever witness. Continuing along the trail, we reached a snow pack that completely blocked our route. After it was determined that crossing the snow pack would be too treacherous, the hardy group decided to scramble straight up to the summit. This actually cut about a mile out of the hike. 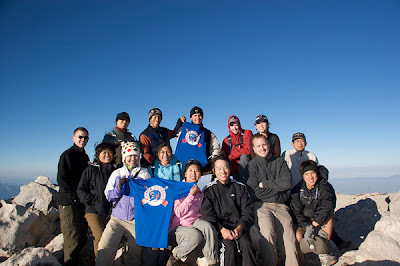 At around 6:20 am, the group settled onto the summit of 11,500-foot San Gorgonio Mountain to take in the sweeping vistas and get some rest. After many photos and some power naps, it was back to base camp. Along the way, we stopped to check out the wreckage of a C-47 cargo plane that crashed into the mountain in 1952. More info about that can be found here: http://www.qnet.com/~carcomm/wreck33.htm. We refreshed ourselves at base camp, packed up and headed home. The overall length of the hike was about 25 miles, with an elevation gain of 4,700 feet. I am happy to report no major injuries or incidents!